“How do you know what families need or want?” This is a question that has come up time and again over the years at Hands & Voices (H&V). For me, the answer has always been pretty simple. We know what families need/want, because we ARE families at H&V. Our entire staff at H&V Headquarters are parents, and/or Deaf individuals and we represent and work with literally 1000’s of parents and parent leaders from around the globe every year. However, it is one thing to have an innate, and subjective sense of what our collective voices say and believe on any given topic and quantifying that understanding through objective and thorough measurements with the national needs assessment. That is why we are so pleased to be able to present this report to reflect on the voices of not only parents who are currently in the ‘system’ receiving supports, but also the parent leaders, parent support organizations, and EHDI system stakeholders who contribute to the success of families navigating their way towards ensuring the goal of children reaching their full potential. We hope that this information can effectively guide and support your efforts so that ultimately the systems of care in place for families and their children, will be appropriate and effective! 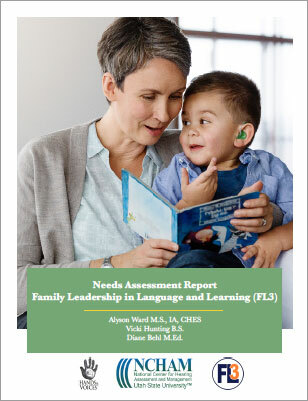 Hands & Voices recently completed a comprehensive national needs assessment to guide its work on meeting the objectives of the newly formed Family Leadership in Language and Learning (FL3) program, a cooperative agreement with the Health Resources and Services Administration (HRSA) in 2017. The needs assessment was designed to take an in-depth look at the needs of families with children who are deaf or hard of hearing (D/HH), family-based support organizations, and state/territory EHDI programs in their ability to work in partnership to improve the EHDI service system. Hands & Voices contracted with the National Center for Hearing Assessment and Management (NCHAM) at Utah State University to conduct these efforts. What types of support did families receive or wish they had when their child was diagnosed as deaf or hard of hearing? What do family support organizations need from the FL3 program to better serve families who have a child who is D/HH? What are the supports EHDI programs need for effective family engagement in ensuring the EHDI programs meet the needs of all families of children who are or are at risk for being D/HH?